Normally, Nicole and I try to create posts focused on travel, books, or wine... not this time. It's Meserve Reserve woodworking edition. Because I built a table and bench set that nearly consumed me for the past week. I have a storied history of table construction. Meaning I've built one table prior -- in high school wood shop class, under the expert tutelage of Mr. Kernan, I constructed a beautiful oak coffee table (really, it is) that took over a year to complete. Unfortunately, over time my (wood) work of art slowly has drawn Nicole's ire and today sits prominently displayed in our storage unit waiting for the day it will no doubt rise from the ashes to grace our home again. Nicole's dislike of all things beautiful high school coffee table may have something to do with my insistence on us renting a storage unit in Arizona for the past eight years while we lived in New York largely for the purpose of storing the table. Or it could be my convincing Nicole to make a cross country road trip with the table in our car so we could unload it at its current home in our New Jersey storage unit. Hard to pinpoint the source of Nicole's feelings exactly. But upon our return to the New York City area (that's what you call it when you've moved to Hoboken, NJ), we decided renting an apartment with outdoor space would be paramount. This restriction severely limited our options, but we eventually found a space we are happy with, signed a lease, and, as I wrote about earlier, set about getting to know the new neighborhood. Upon moving in, Nicole began sketching plans to fill our brick paved, back yard area. One thing became certain, we wanted a large table and benches for entertaining. Soon we discovered another certainty, eight foot long table sets are incredibly expensive! And it seemed silly to shell out a large sum with a high end table builder named Travis living under our very roof. Truthfully, I became excited about the prospect of dusting off my woodworking skills for a reunion tour. This time around I had severe constraints, namely no well equipped high school wood shop. 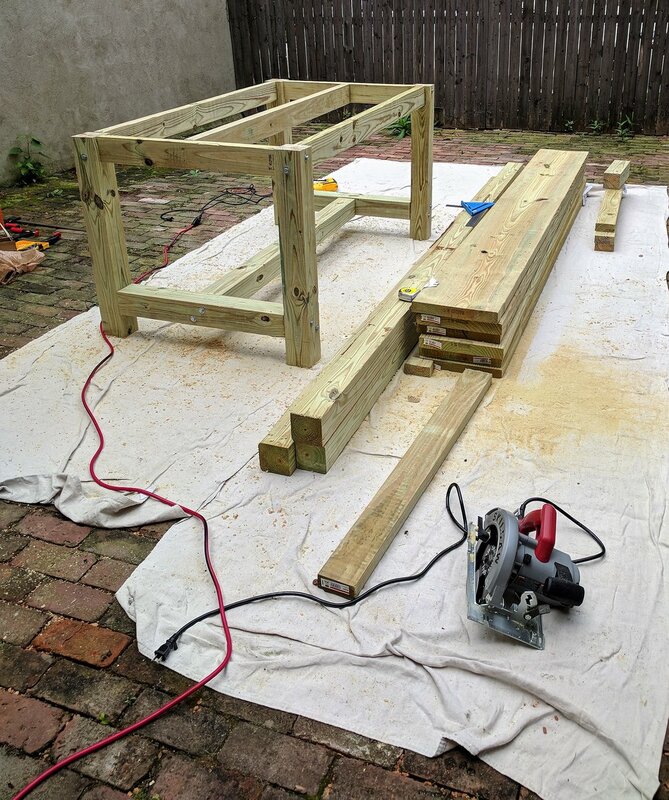 Instead, I used a newly purchased circular saw, power drill, and some hand tools. But constraints foster creativity! So over the course of a few days I sketched my plans on a napkin, researched various materials and fasteners (I ended up using heavy duty, six inch galvanized lag screws to join the 4x4s within the tables base; nearly a third of the final materials cost of the table went toward screws! ), and created a supply list. My first shock came after I picked out lumber and supplies over the course of a half day lost at Home Depot. Our little Mitsubishi crossover is great for many things... hauling a few hundred pounds of lumber, some ten feet in length, is not one of them. The worker who helped me load the timbers assumed I would somehow be securing the wood to the roof. Oh no my friend, we're going to nose it all the way through the console to the dash and then leave the remainder hanging out the back. Tie downs? No way, I'll just drive slow. My tools and supplies for the project. Back at the apartment, construction itself progressed with relatively few hiccups. The work took longer, and was physically more difficult than anticipated, but after five days in the back yard hunched over (I should have bought sawhorses! ), saw dusty and sweaty, we had a table. 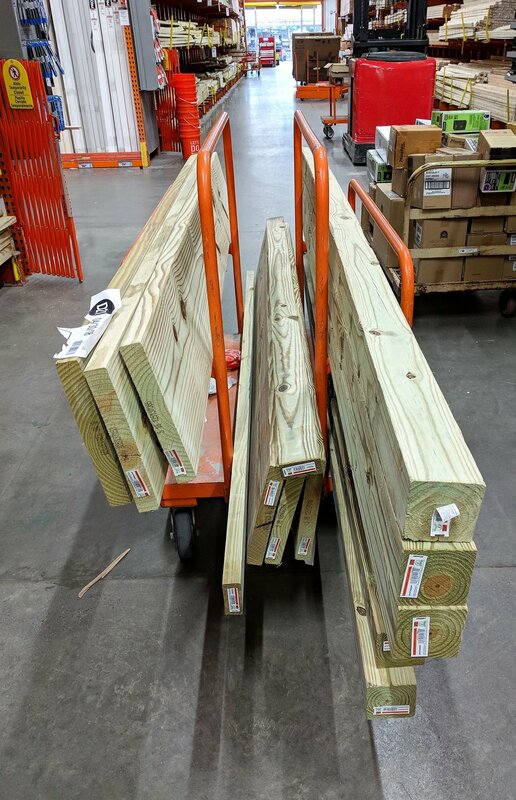 Total cost, about $200 for lumber and $250 for supplies, with half of the supply cost going toward tools I'll hopefully have and use for a long time. Overall, I am very pleased with the result -- enough so to dedicate a blog post to it(!) -- and hope to make many great memories around our new table and benches in the future.